“What good does it do to have 10 ‘Indianas’ done wrong, if instead, by teaching the method, we get them done right, even if it takes two days?” asks Project Lia founder Elizabeth Wallin. By “Indianas” she means painted wooden wall decorations of the Midwestern U.S. state. Valuing an employee’s skill base, creativity and learning process is one of the lessons Elizabeth is learning through her relationship with her employees. The two women working at Project Lia, a small non-profit social enterprise in Indianapolis, Indiana, come from difficult backgrounds and, partly as a result, ended up incarcerated. Now they’ve completed their sentence and they’re trying to make it on their own two feet. Project Lia aims to provide them with a path to financial stability through a creative and supportive work environment, a positive job experience to increase their chances of permanent employment, and a stepping stone away from the situations of poverty that led to incarceration. ​The idea for Project Lia came about when Elizabeth was doing an internship with a business of the Economy of Communion in Indianapolis. Part of the internship was to create the plan for a business she would one day like to own. “I wanted to learn something concrete that I could launch as a career or get heavily involved in a social project,” she said. Her boss knew a group of women who were making regular visits to the local women’s prison. They asked Elizabeth to do an analysis of the needs of those exiting prison. 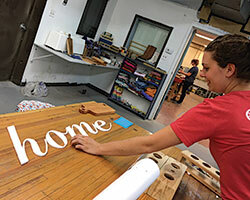 She remembered seeing a vendor in Brooklyn, New York, selling refurbished furniture made by formerly incarcerated men and thought of doing something similar in Indianapolis. She had seen a lot of wooden furniture being thrown out on the street that could be gathered for free, and after a home furnishing analysis the process just kept evolving. In the summer of 2017, nine months after she started laying the foundations to start a non-profit, Elizabeth was able to officially open Project Lia’s offices and workshop. They found space in an old industrial complex in downtown Indianapolis where other small businesses and creatives have gathered, bringing it to new life. So far, they sell their products there, at fairs and farmer’s markets in the area. Many of these women are mothers who have to provide for their children, and they do whatever they can to get a meal for them, explains Elizabeth. “The stress of that kind of situation doesn’t allow you to sit back and make long-term decisions,” she said. “People understand this in theory, through research, but often our institutional structures do not take into consideration the heavy burden of chronic stress that people in poverty disproportionately are going through, and how big of a barrier is set up between them and doing things the right way, finding a path to a better situation,” says Elizabeth. Project Lia tackles those challenges on a very small scale. “I’m already seeing impact in just having someone’s back and providing a space with structure, but also with room for creativity,” says Elizabeth. When other responsibilities might seem too much — worrying about probation fees, making ends meet, finding housing — their work environment can provide small tasks and small successes. This is the benefit of starting to work at this non-profit project: “If I say ‘I don’t care if you understand; I care if you have 10 Indiana’s done,’ then I never really help this individual. Then the next place they go, we are back at square one because we haven’t addressed the roots of the problem: self-confidence, confidence in the community around them and work-ready skills,” said Elizabeth. And when they share their stories with the community in moments like their First Friday open workshops, or weekend farmer’s markets, where they also sell their goods, the community sees value not only in the product but also in the process behind it and how it offers a meaningful experience to employees. This model benefits the business too, because when the Indianas are made correctly, you have a beautiful product you can sell.